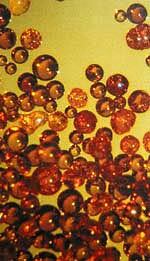 PRP Resins have been manufacturing resins for the paint and ink industries for over 50 Years. We manufacture to SABS standards and have ISO 9001/2000 certification. PRP Resins has an extensive range of resins used in a diverse range of markets such as coil coating, automotive refinishing, decorative paints, general industrial coatings, printing inks and wood coatings. PRP Resins is committed to producing the highest quality resins to stringent quality control methods in accordance with SABS and ISO 9001/2000 standards and backed by the Polymer Science Institute of the University of Stellenbosch. PRP technical and sales personnel are experienced in both paint and ink resin technology and offer prompt technical service. We deliver a level of customer service that is second to none, and are committed to developing long term partnerships with our valued customers. Find out more about PRP Resins, or view more information about one of our products on the right . If you have any questions, please don't hesitate to contact us. If you need other paints & coatings, visit Dekro Paints.